With this podcast, we are starting a series of episodes on "phrasal verbs." These podcasts are intended for students with a high level of English as phrasal verbs can at times be tricky to learn. If you find this podcast too difficult, we invite you to listen to a few of our much earlier episodes in the series, which hopefully will be adapted to your needs. You may also wish to try our other series called "Your English." Doing this oral work is far more challenging than doing written exercises. 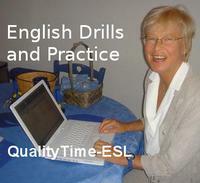 QualityTime-ESL podcasts are intended for hard-working learners who want to perfect their English. And here is the list of "Your English" podcasts.